Sometimes, I cut through a part of Post Alley from the main Pike Place Market area in the Seattle city. That is a moment with an atmosphere I enjoy, with the echoes of its partial underground amplifying the joys of tourists chatting and the busy street traffic above (being that this alley dips under into a slight ditch and tunnel). The overall Post Alley is a place of disconnected fragments, confusing to newcomers. There segments are close to each other in the area, each with a separate charm to itself. The particular area I enjoy, is the one with the famous Gum Wall of which I shared some findings on, here. There is much else, including a few old shops, some bars, the entrance to a small theater I have yet to visit. A little more promotion than usual, but that’s okay. Much here is a reminder of the happenings of Seattle, and social joys one can connect with. Take it all in with these gifts of randomness present. Try not to process all, or look too hard at some meanings. Then, walk away feeling some kind of emotion. Mind is usually simple joy, with sprinkles of inspiration. 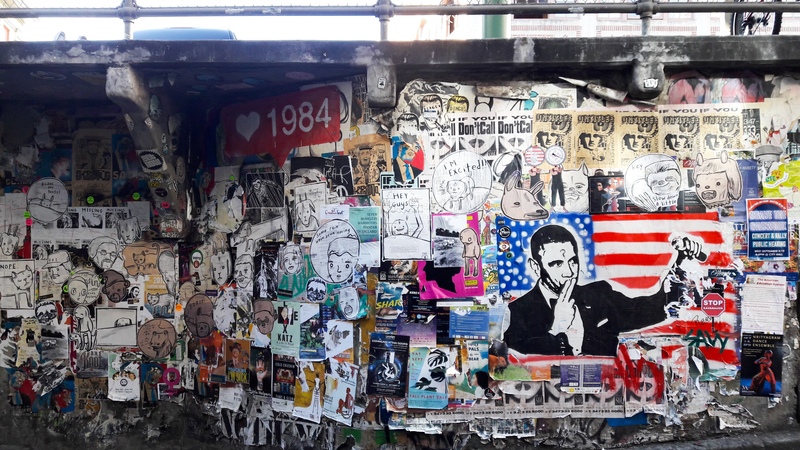 Yesterday, I posted a small portion of some amazing wall art one could see in the Post Alley opening (located under the side of Seattle’s famous Pike Market). Now, I share a bit more. What is now seen is only what’s here for now and certain to change over time. No two visits over an extended time period are the same. I will look forward to every revisit. But for now, explore with your eyes..